What a fantastic weekend! Okay, well Duke might have lost in the first round of the ACC tournament, but I cleaned up at poker! And I got to spend Saturday cooking, which is of course my favorite pastime. Plus I have a fantastic husband who did all the post-party dishes while I leisurely drank coffee in bed on Sunday morning! By picking a party menu that was on the easy side, but with so much flavor, I was able to truly entertain with ease. Most everything could be made in advance and grilled or baked as everyone arrived, so I was able to enjoy myself and focus on my poker face. I always like to pick a dessert that you can make the day ahead because baking on top of any other prep can be way too stressful. And just make sure you have one or two things that can sit out, so you don’t feel rushed to the kitchen the second your guests arrive. That way you can enjoy a cocktail with your friends before finishing up the food! 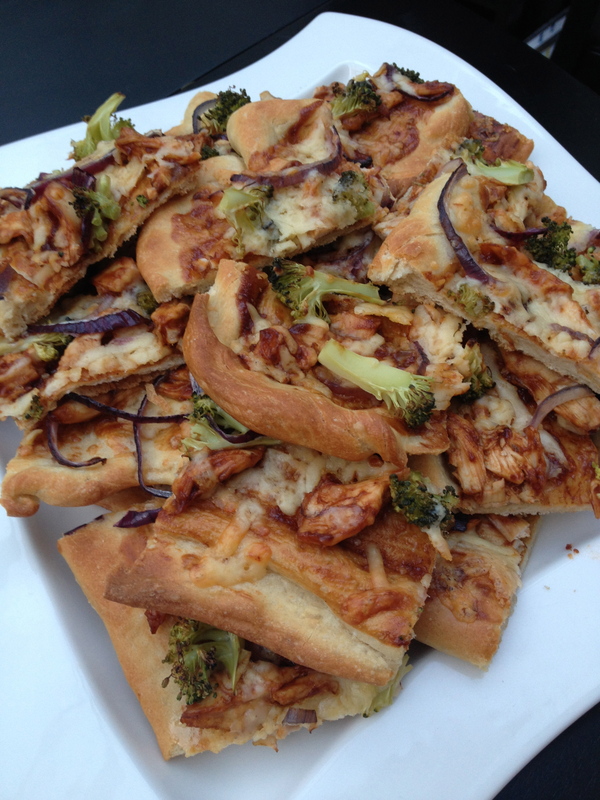 The BBQ Chicken Pizza I made was actually the first recipe I ever created. I grew up helping my parents in the kitchen, peeling potatoes and stirring sauces. So at some point, probably after one too many I’m bored‘s, my mother suggested I enter a Kraft/Pillsbury recipe contest. Flashback: this was well before the internet craze, back when you found out about these sorts of things on the actual product package. This was the early 90s after all. Also please note that this was prior to the arrival of California Pizza Kitchen, or really any gourmet pizzas in NC. If it didn’t have pepperoni and extra cheese on it, I’d never heard of it. 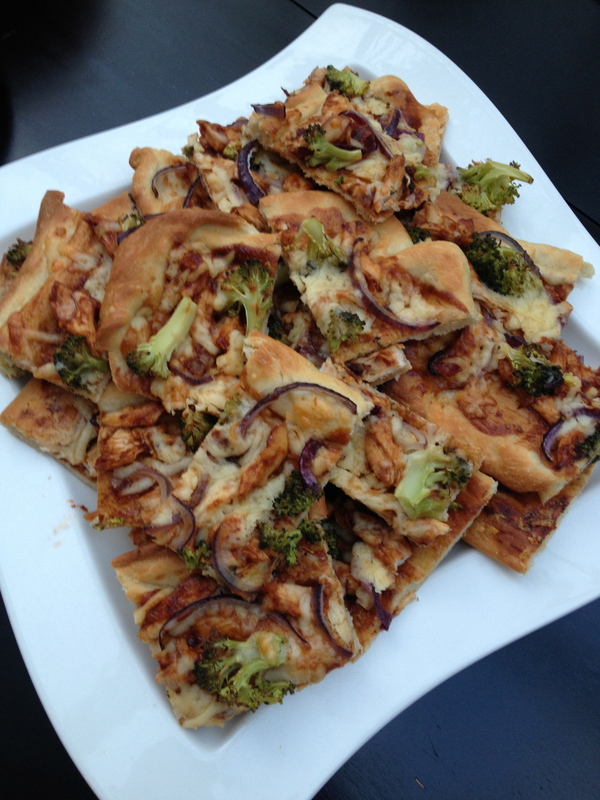 So I’m not claiming I invented the BBQ Chicken Pizza, but in my little 12 year old bubble, this was 100% original. So given that I was 12 years old when I created this recipe, let’s just say it’s not going to be the most challenging thing you’ll ever make. But I promise you it’s soooo good!! 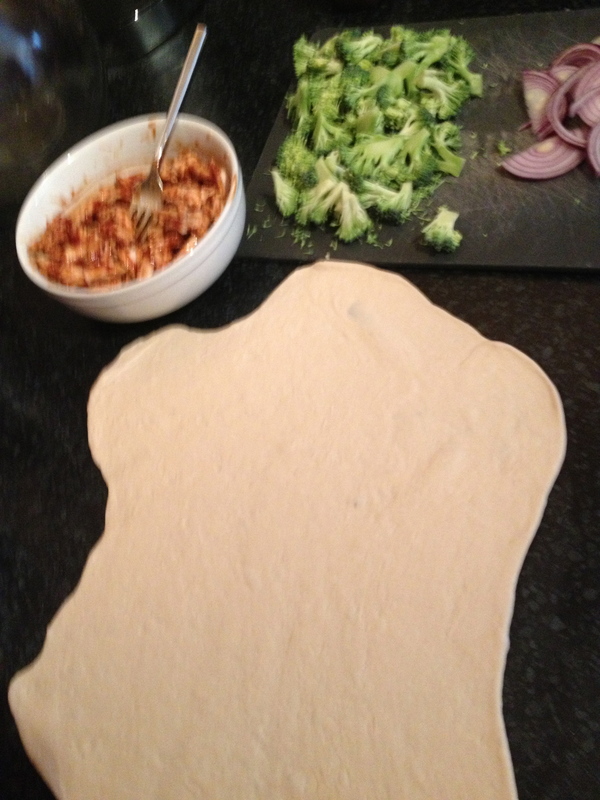 Start by rolling out pizza dough until it’s very thin. I used my basic bread dough recipe for the base, though you could channel my adolescent self and buy a canned Pillsbury pizza dough. Either way, you’ll want to par-bake (partially bake) the bread so that the BBQ sauce doesn’t make it soggy. While it bakes for about 5 minutes, prep the toppings by slicing the onions and chopping the broccoli, making sure it’s small so that it can roast through when cooked. Then shred the chicken and toss it with BBQ sauce. Evenly spread the toppings out over two pizza doughs and bake for about 8 more minutes, until the cheese becomes bubbly and golden. If you are serving this pizza for a get together, be sure to cut the pieces on the smaller size so people can nibble throughout the evening. Roll/toss the pizza dough to the size of your baking sheet. Spread out on the baking sheet and par-bake for 5 minutes. Meanwhile, toss the chicken with 1/4 cup of BBQ sauce. Chop the broccoli into small bite-size pieces. Remove the baked pizza bases from the oven. Spread the remaining BBQ sauce evenly on both doughs. 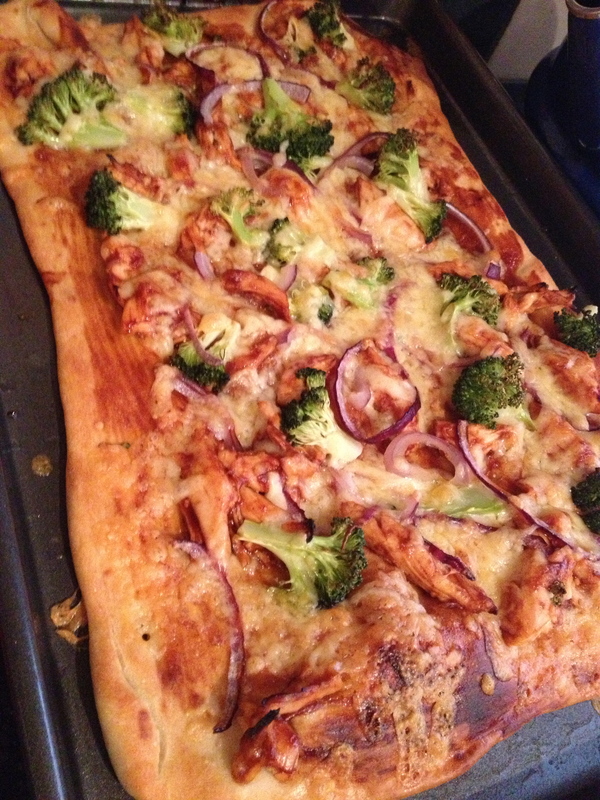 Divide the chicken, broccoli, and onions evenly over the two pizzas. 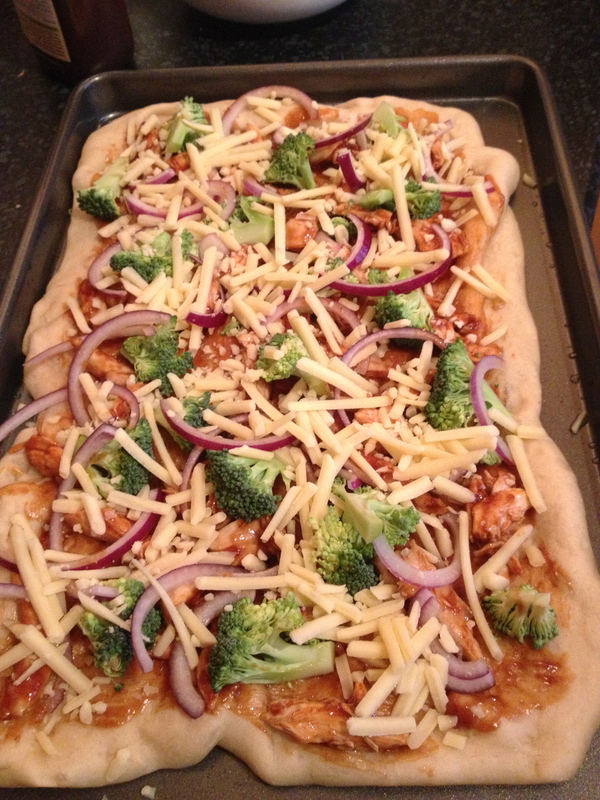 Sprinkle with cheddar cheese and continue to bake for 8 minutes, or until golden brown. « My Prague Blog… haha.